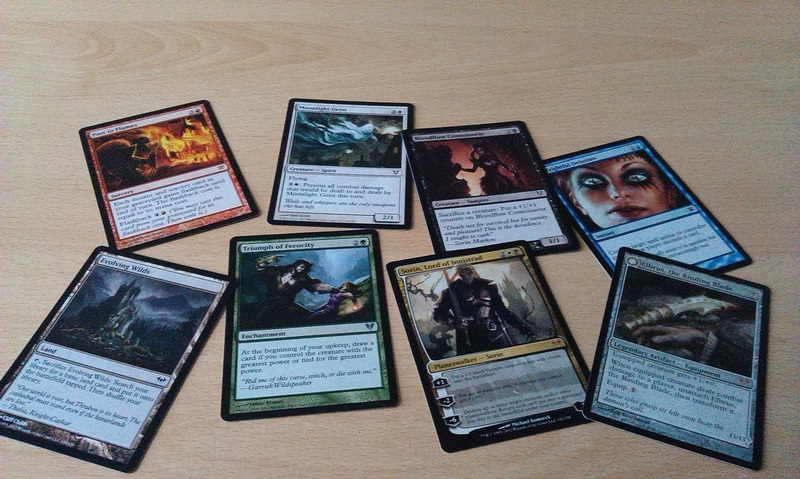 It’s game day once again here at spalanz.com, and today I have something that I think is fairly interesting to share with you all: I’ve been thinking once more about Magic the Gathering, and have made some tentative steps into getting back into the game! 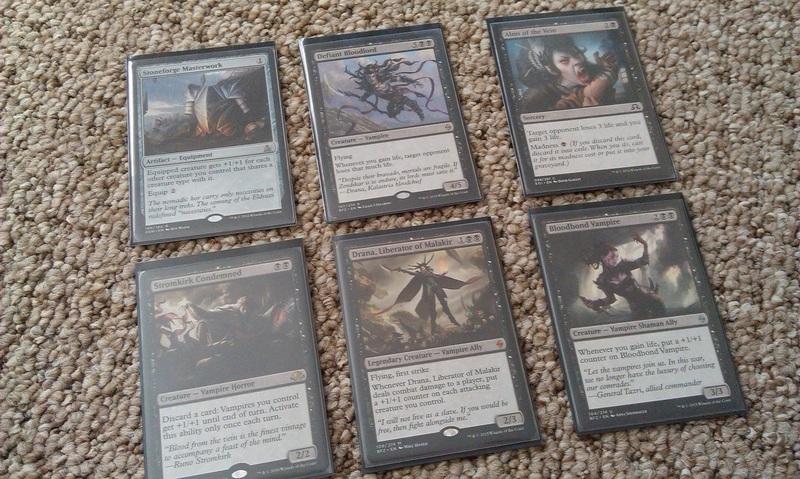 Remember at the back end of last year, when I tried my hand at a B/W Vampires sealed deck? Well I’ve been trying to do something more with that, making it more interesting while keeping it just within the Ixalan block rather than trying to be a full Standard experience. Well, I’ve been shuffling about with things, and while it might not be the best of decks out there, I thought it was cool enough that I wanted to share it here for game day! One of the things I really wanted to try with this build is making a ton of Vampire tokens, getting really aggressive with them, and if they die, then they just make Elenda bigger – or the Bloodcrazed Paladin, of course, if I can flash him in for a few +1/+1 counters. Having a lot of pump spells in there also should help to make those tokens more than just meh, and I particularly like things like the Sanctum Seeker and Bishop of the Bloodstained for causing direct life loss rather than having combat as the only way to win with an aggro deck. 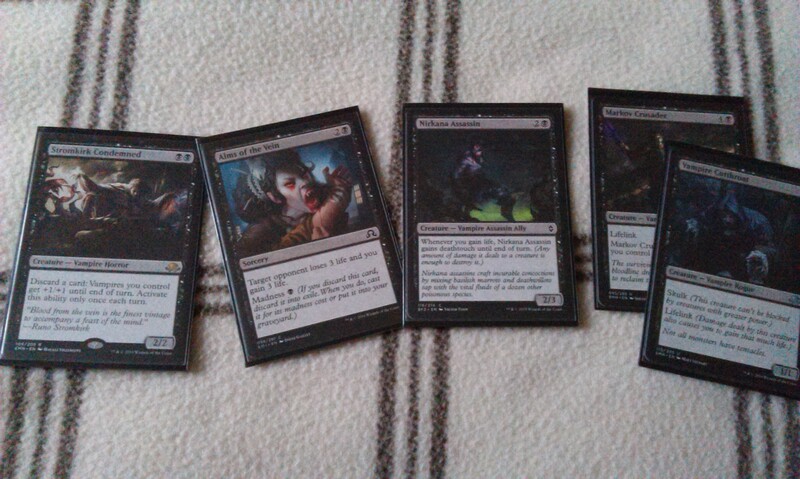 I’ve built a lot of Vampire decks along the way, of course, and while I think I’ll always prefer B/R Vampires such as this deck from Shadows of Innistrad, I do like the way that Black and White plays in general, which is why so many of my decks over the years have been in these colours. 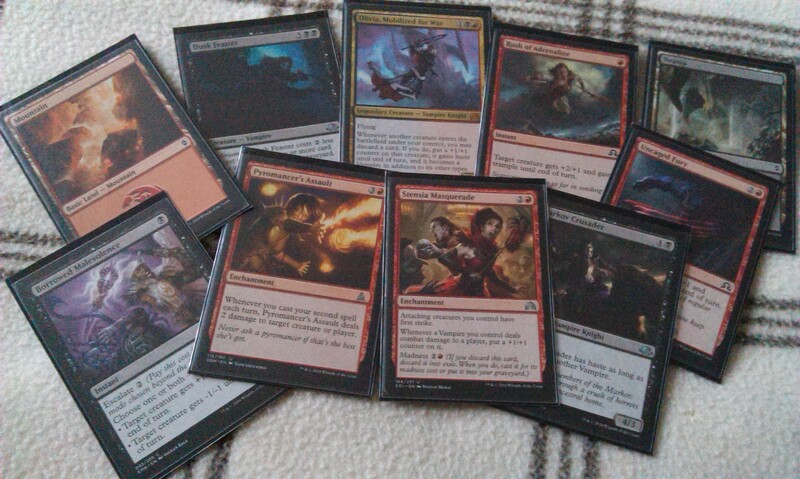 I should also look into building a Mardu Vampires deck – along with building up this deck to a full 60 cards, I’ve had a number of thoughts on tinkering with the Edgar Markov Commander deck from last summer, too. I think there is plenty that can still be done to this deck to improve it, and to that end I’ve got a few singles on order to help refine the play somewhat, including a second copy of Elenda. My first build of any deck tends to be a little bit wild as I try to jam in as many copies of interesting cards as I can, before finally trimming things down to more efficient methods. I mean, the aforementioned B/R Vampires deck ran like a dream, and I’d like to see if I could do the same thing with this build in B/W. Crucially, I’ve had no opportunity to test this deck yet, so I’m hoping that I’ll have some further insights once I’ve managed to get in a few games. My time for Magic-playing has been almost non-existent for the past year, so I think I need to re-evaluate things and see if I can get back into game nights and whatnot! 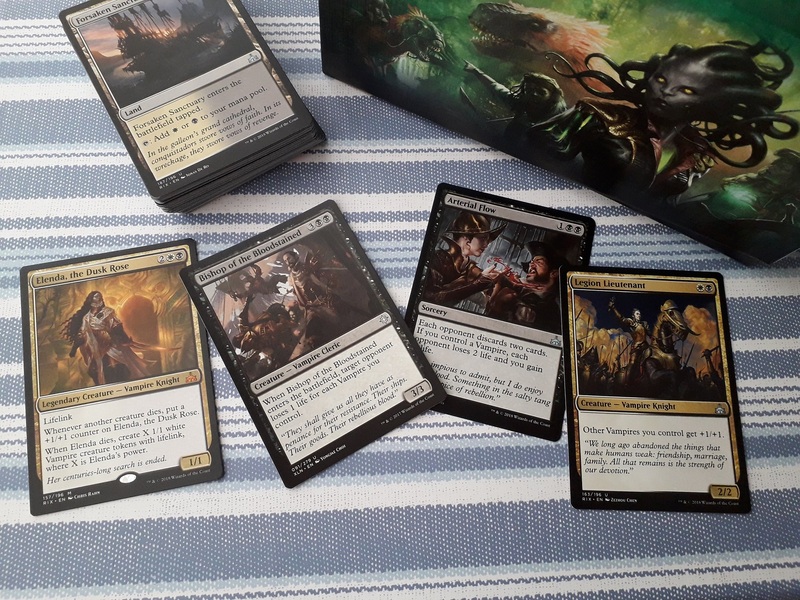 Anyway, I think the fresh new look of Dominaria has gotten me intrigued enough that I’m once more buying Magic products and seeing what’s occurring in the multiverse, and I’m excited to see what’s coming up next in my deckbuilding adventures! There’s a distinctly horror-filled theme to game day blogs this month, as we approach ever-closer to Halloween and, today, I thought I’d share with you all a deck that I’ve built for Magic the Gathering that sees a lot of stuff I never thought I’d use in a deck! 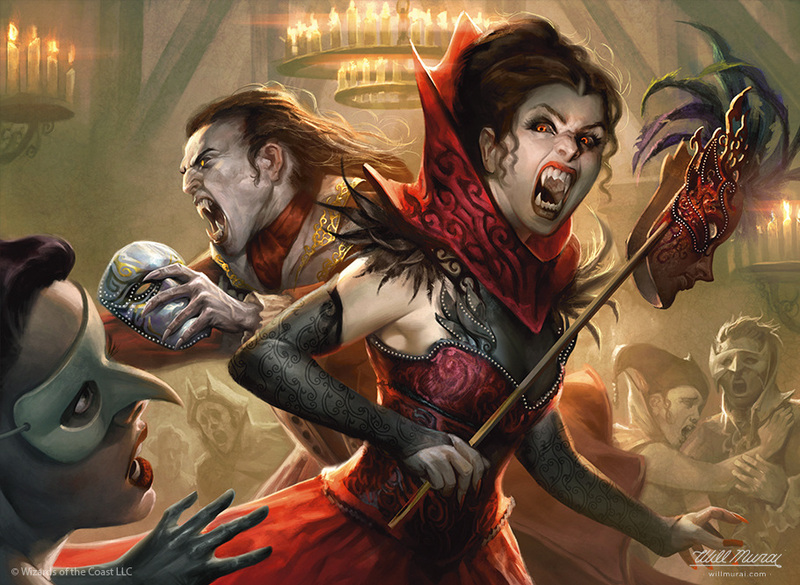 We’re headed to the plane of Innistrad, where vampires and werewolves prowl the night, and it’s all the people can do to invoke the angels to keep them from harm! 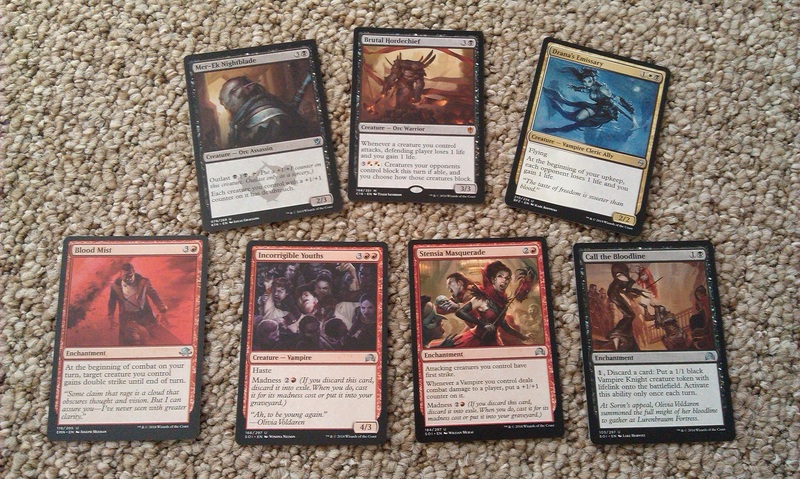 Innistrad block came out across 2011-12, and features the expansions Innistrad, Dark Ascension, and Avacyn Restored. As per usual, we had several new mechanics featured in the block, the most famous of which being the double-faced cards. These cards have no card back, but instead feature a day and night side, with text that describes the conditions under which the card turns from its day to its night side (and sometimes, night to day). The card never leaves the battlefield, so any auras or counters remain on that card after its transformation. The mechanic was predominantly used on human cards that transformed into werewolves, though there were a couple more instances (including a knife that turns into a demon). This really serves to highlight the gothic horror theme of Innistrad, which is perhaps one of the most flavourful sets ever released for Magic the Gathering. There are predominantly five tribes explored over the cards in the set, each tribe belonging to an allied colour pair: the aforementioned werewolves in red and green; vampires in black and red; zombies in blue and black; spirits in white and blue, and humans in green and white. 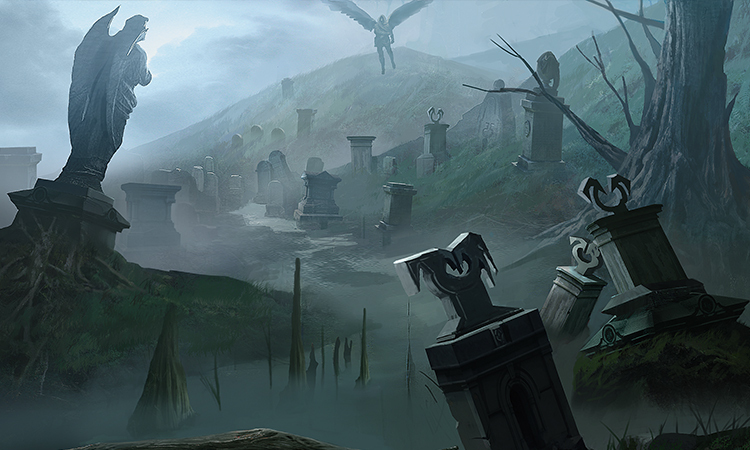 Innistrad, as a horror-themed set, also featured graveyard mechanics such as Flashback (first seen back in Odyssey), as well as wider graveyard strategies in general. Morbid was a mechanic that granted creatures benefits if another creature died this turn. Dark Ascension continued the horror theme by giving us Undying cards, which triggers when a creature without +1/+1 counters on it dies, bringing the creature back with such a counter. Fateful Hour is an ability that triggers if your life total is 5 or less, often providing a last-minute boost for creatures in some way. Despite often being overlooked, I think this mechanic is one of my favourites purely for the theme! 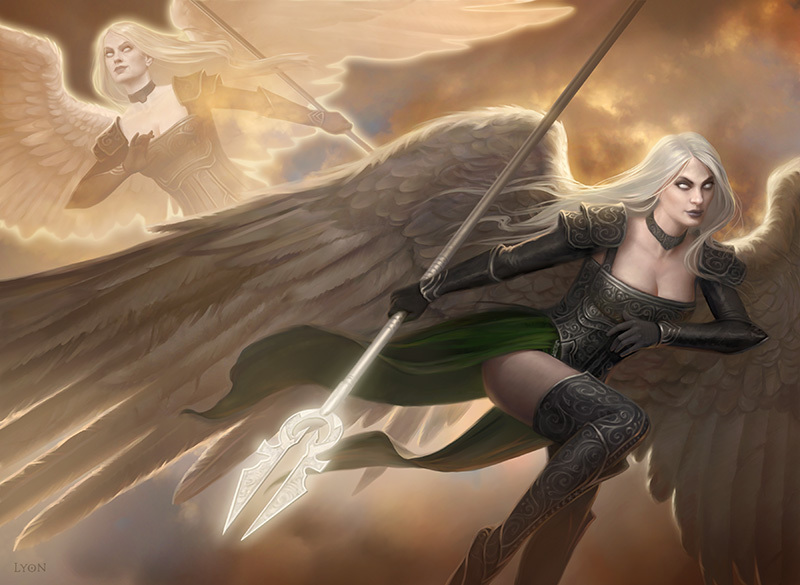 Finally, Avacyn Restored brought more new mechanics, including Miracle, a card that could be cast for its Miracle cost if it is the first card drawn that turn – the card frame was changed slightly to show that the card was a Miracle card, and led to players doing that weird sliding the card across the playmat towards themselves to ensure the card didn’t hit their hand before they cast it. Soulbond allows you to pair a creature with another creature, and both of them get a specific ability as a result. 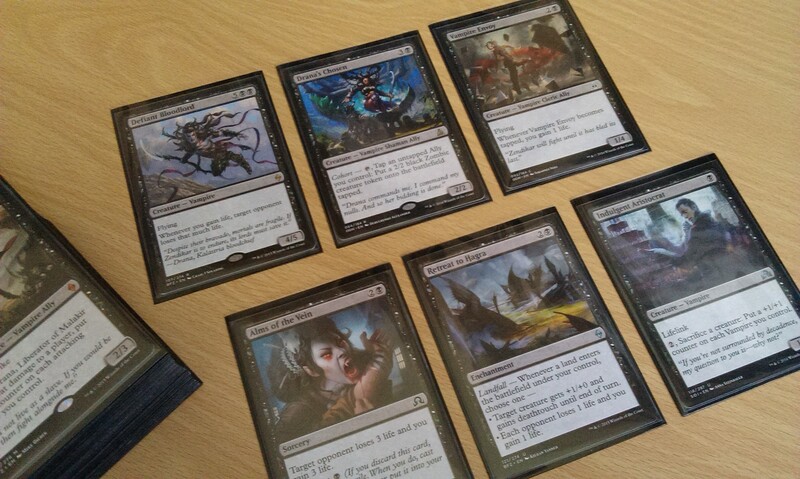 Both mechanics featured across all colours except black, which saw a return of the Undying mechanic and an emphasis on controlling just one creature (as the opposite of Soulbond). Innistrad block is widely said to be one of the best in Magic’s recent history, with many people praising the theme as well as the play environment. 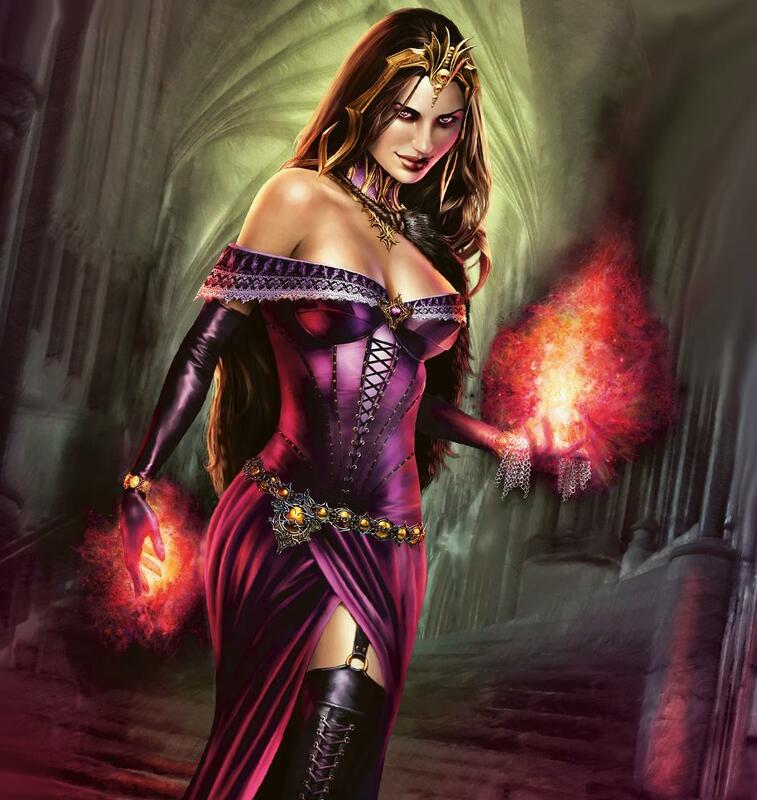 There are a lot of notable cards from the set, though perhaps overwhelmingly worth mentioning here is Liliana of the Veil, the second Liliana planeswalker card, and a card that is widely agreed to be the second most powerful planeswalker in the game. 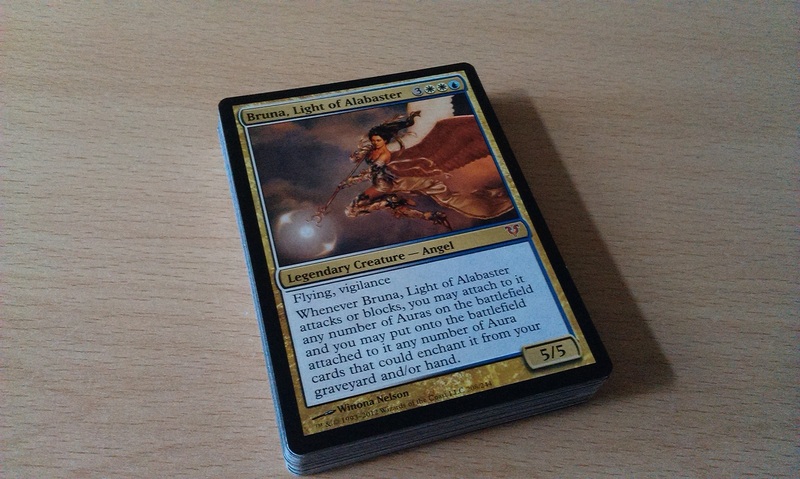 Sadly, I don’t have enough kidneys to sell to afford a Liliana of the Veil, so the deck I’ve been tinkering with for a while is centred instead on one of the Angel cards from Avacyn Restored: Bruna, Light of Alabaster. It’s nothing special, but there are some fun things going on there that make me happy, so I can’t complain too much! I do want to look at the mana base some more, and there are a few cards I’d like to include to further help the strategy (Champion of the Parish is top of that list!) But I thought I’d play with this thing first, and see where it takes me from there! 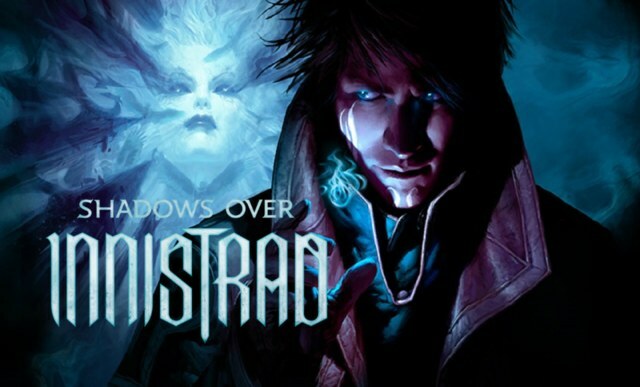 Innistrad is definitely one of those sets that has stood the test of time, with plenty of flavourful cards that I find myself coming back to time and again. Well, I do love me some vampires!! 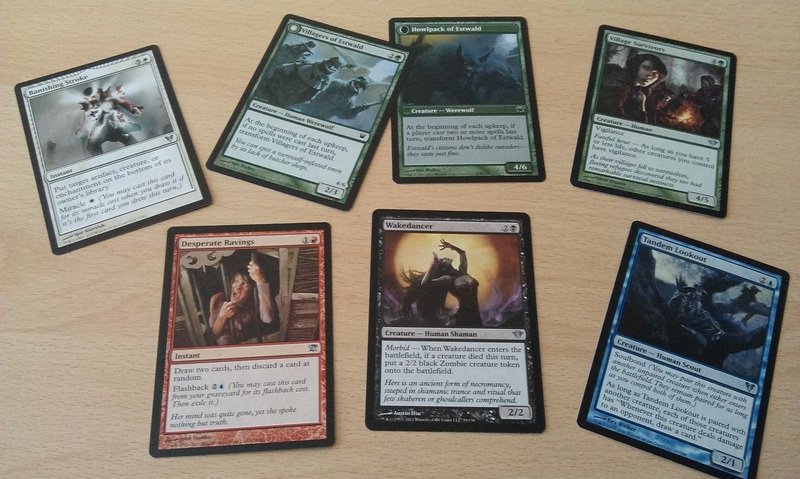 So this weekend, I had one of the Commander 2017 decks delivered, Vampiric Bloodlust, and have spent a couple of days thinking about mixing it up a little with some of my favourite Vampire cards from recent memory! Commander 2017 is the tribal-themed set, and while previous years have seen five preconstructed decks released around November time, this year we’ve got just four decks, and they’re out three months early! Colour isn’t a thing, so we have two-colour Cats, three-colour Vampires, three-colour Wizards, and five-colour Dragons! I kinda wanted them all, of course, but settled just on the Vampires right now. Eminence – Whenever you cast another Vampire spell, if Edgar Markov is in the command zone or on the battlefield, create a 1/1 black Vampire creature token. So not only do you get to create tokens, you also get to buff your entire team! Wonderful stuff. I say “entire team”, of course, because pretty much the whole damn deck is made up of Vampires! I’ve got a couple of cards in there from Tarkir block that will help to keep the theme going. So let’s take a look at the cards I’ve been fiddling about with! First of all, I wanted to go with my old favourite of lifegain-and-drain, along with some of my favourite Vampiric buffs around right now. Stoneforge Masterwork is a particular favourite from Oath of the Gatewatch, which gives the equipped creature +1/+1 for each Creature type you control that shares a Creature type with it. Drana, Kalastria Bloodchief is included in the deck, though for this particular deck really bounces with her latest incarnation from Battle for Zendikar, Drana, Liberator of Malakir. Suited up with Stoneforge Masterwork at the head of an army of Vampires, she could be doing some pretty decent damage! At least, I hope so! Battle for Zendikar block, and Shadows over Innistrad block have both got some really terrific cards to use in a Vampire deck, of course, so I’ve been plumbing some of those depths! I mentioned it in a previous Vampires deck blog of course, but Stensia Masquerade is a really great card for this. 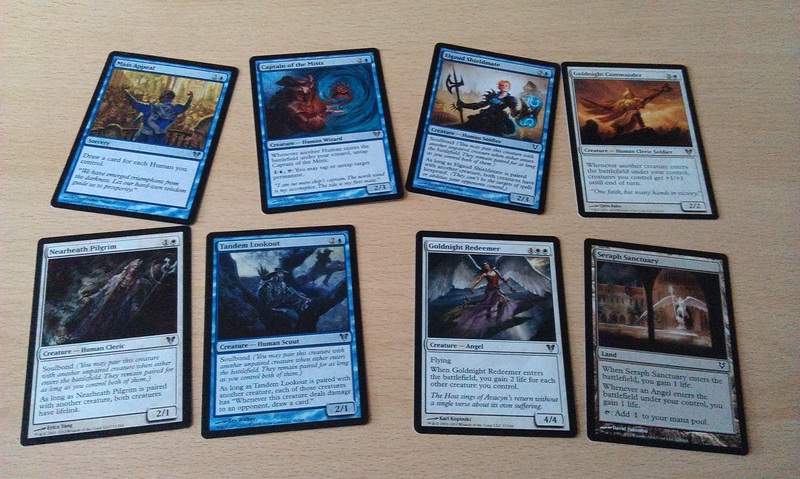 The deck also comes with Rakish Heir, another favourite of mine for this kind of deck. Putting the counters on these cards is good and all, but then what, right? Well, that’s where Mer-Ek Nightblade comes in, making the counters count. Heh. 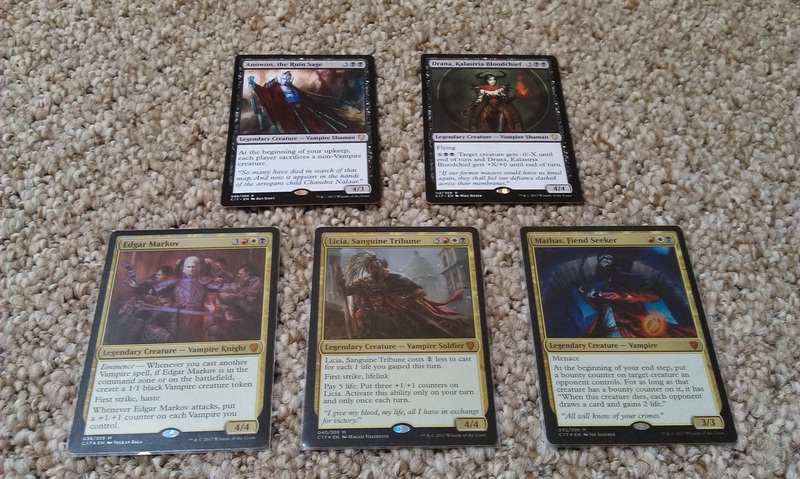 Edgar Markov is, of course, Sorin’s grandfather, so it’s pretty flavourful to get one of the Sorin Planeswalkers in there. 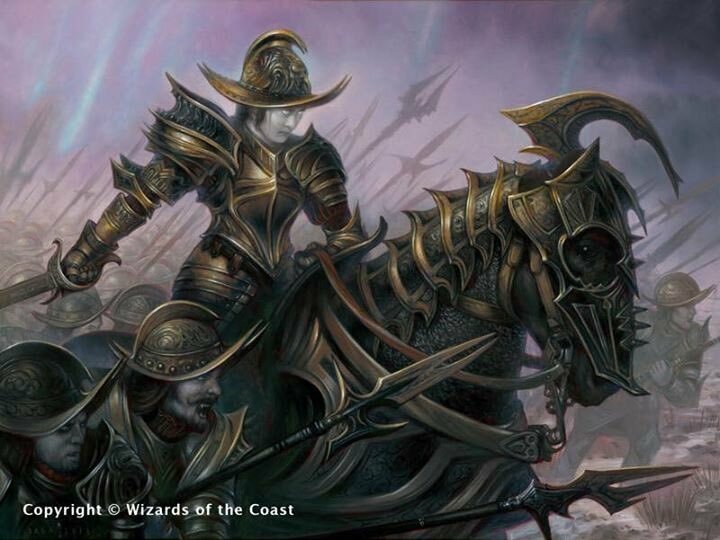 I quite like Sorin, Lord of Innistrad, though Sorin, Grim Nemesis could be useful, and his -X should work well with the included Sanguine Bond. It’s quite annoying that we have Sanguine Bond but not Exquisite Blood, which would perhaps have been the more appropriate card to include. Not to mention, that card needs a reprint! So anyway, I’m going to be taking a bit more time to go through the deck and sort it out so that it plays a bit more how I’d like. Stay tuned folks, it should be glorious! Author spalanzPosted on August 29, 2017 August 28, 2017 Categories board gamesTags Commander, deckbuilding, game day, Magic the Gathering, Vampires1 Comment on Vampires!